ISO 12233:2014 E-SFR charts are implementations of the Low Contrast Edge SFR (E-SFR) test chart illustrated in Section 6.1 and Annex C of the ISO Standard Document. We offer the Enhanced version of this chart in high resolution photographic prints, suitable for high resolution sensors up to 54MP at the 4x size. All Imatest ISO 12233:2014 E-SFR charts are fully compliant with the ISO standard. The Imatest eSFR ISO module provides highly automated support for the new charts. 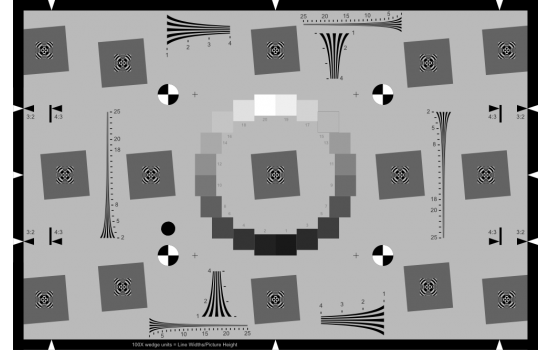 ISO 12233:2014 E-SFR chart has all the features of the Standard chart, keeping the 3:2 aspect ratio, with the addition of six added slanted squares for measuring performance near the image boundaries and hyperbolic wedges for visual analysis or analysis with the Imatest Wedge module.